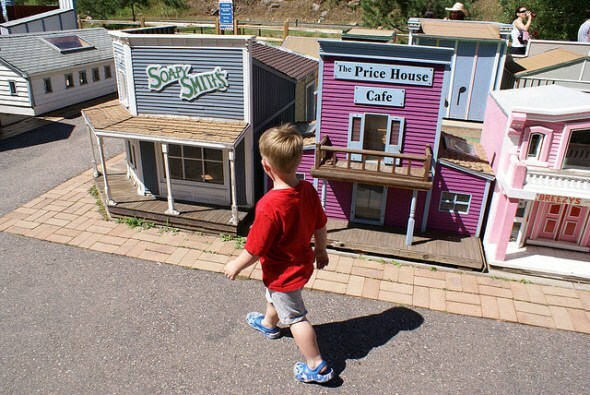 Visitors to Tiny Town & Railroad can walk down streets with 90 child-size buildings and ride miniature trains that follow a 5/8-mile track in the foothills west of Denver. The town also has a playground, snack bar and gift shop. It is open for summer weekends. Tiny Town got its start in 1915 as Turnerville, named for its builder, George Turner, and located at the Denver-Leadville Stage Coach Station. It opened to the public in 1920. The town reached its peak in 1924 with 125 buildings that included a grocery store, barber shop, pool room, hotel, school and church, along with two lakes. The town also had an Indian pueblo. A series of floods, a fire and other reversals between 1929 and 1983 nearly killed the town. But the Northern Colorado Chapter of the Institute of Real Estate Management (IREM), an association of property managers, stepped up in 1987 to take over Tiny Town and restore the buildings and trains. 6249 S. Turkey Creek Rd.